devRant is a fun community for developers to share and bond over their successes and frustrations with code, tech, and life as a programmer! There are a lot of great technical resources for software developers out there, but not a lot of places you can go where you can talk about your life as a programmer with other people who really understand what’s got you feeling like a coding genius or like you’re surrounded by idiots (ok, maybe both). That place is devRant. Enjoying devRant? Please leave us a review! 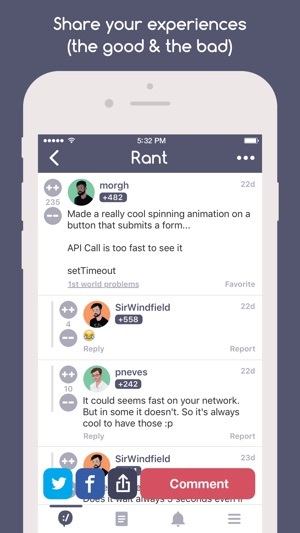 - Introducing rant filters! You can now filter the feed by rant types! 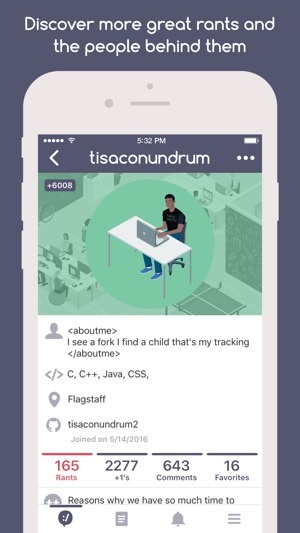 - Introducing notif tabs! Your in-app notifs are now viewable by type so you can quickly browse whichever notifs you want! 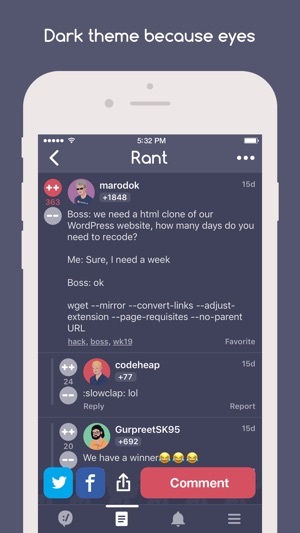 - You can now "scroll to bottom" of any rant that has 10 or more comments! - New "post type" selector for easier classification of rant types in the future! - Introducing the devRant supporter program (devRant++)! 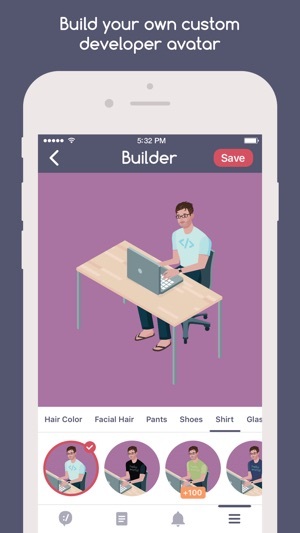 Get cool features (extended rant/comment editing time, special badge, etc.) while also helping us pay for our increasing server costs. More perks coming soon! - Thank you: we are very appreciative of all the positive reviews and awesome feedback. Please note that our team (1 dev and 1 designer) are working extremely hard to fix the remaining bugs. It's one of our top priorities to squash them all. Thank you! 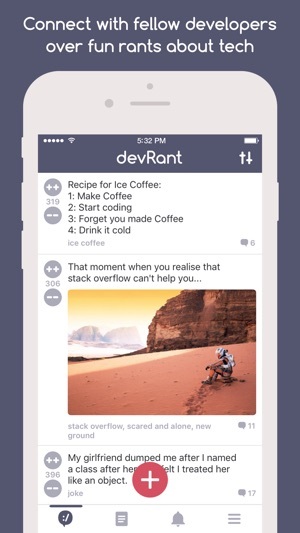 - If you are enjoying devRant, please take a moment to leave a review for the app. This helps new developers find the community and leads to more fun rants! Don’t hesitate to get involved. It truly is an outstanding community. Considering most others out there (which I will not name) have such a toxic community. From my very own experience I can tell that the idea, as always, was great, but the community of people most vocal there consists mostly of self centered ignorant angry thugs. I tried, I posted, I left unimpressed. Probably great if you’re real young and/or immature. Kinda feels like BBSs's I used to hang out on when I was 13.